Cancer is a deadly disease that can happen to anyone and a battle with a cancer is very exhausting on every front physically, emotionally and financially. In this situation support the individual is the only way out of the situation. To support physically and emotionally the family member are there and to support on financial front LIC brings you the Cancer Cover Plan. 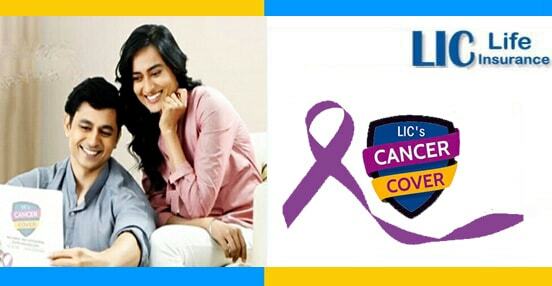 LIC cancer cover is a non-linked, non-participating, health insurance plan. It is a regular premium payment health insurance plan which provides financial protection in case the Life Assured is diagnosed with any of the specified Early and/or Major Stage Cancer during the policy term. The plan offers two benefit options wherein you have the flexibility to choose the type of Sum Insured at the inception. Option I Level Sum Insured: The Basic Sum Insured shall remain unchanged throughout the policy term. Option II Increasing Sum Insured: The Sum Insured increases by 10% of Basic Sum Insured each year for first five years starting from the first policy anniversary or until the diagnosis of the first event of Cancer, whichever is earlier. According to the Research of The National Institute of Cancer Prevention and Research (NICPR), The estimated number of people living with the disease is around 2.5 million and every year new cancer patients registered is Over 7 lakh people out of which 5,56,400 die due to untreatable cancer. In India, Cancers of oral cavity and lungs in males and cervix and breast in females account for over 50% of deaths. Cancer spreads to the adjacent organs in the body and the process is called invasion, this invasion makes this disease lethal and may cause serious illness, disability or death. Lump sum benefit: 25% of Applicable Sum Insured shall be payable on the first diagnosis of any one of the specified Early Stage Cancers and the Premium for next three policy years or balance policy term whichever is lower, shall be waived from the policy anniversary coinciding or following the date of diagnosis. A Lump Sum 100% of Applicable Sum Insured less any previously paid claims in respect of Early Stage Cancer shall be payable on the first diagnosis of the specified Major Stage Cancer. An Income Benefit of 1% of Applicable Sum Insured shall be payable on each policy month following the payment of Lump Sum, for a fixed period of next ten years irrespective of the survival of the Life Insured and even if this period of 10 years goes beyond the policy term. In case of death of the Life Assured while receiving this Income Benefit, the remaining payouts, if any, will be paid to his/her nominee. All the future premiums shall be waived from the next policy anniversary and the policy shall be free from all liabilities except to the extent of Income Benefit as specified above. Early Stage Cancer Benefit shall be payable only once for the first ever event and Life Assured shall not be entitled to make another claim for the Early Stage Cancer of same or any other cancer. However, the coverage for the Major Stage Cancer under the policy shall continue until the policy terminates. Once a Major Stage Cancer Benefit is paid no payment for any future claims under Early Stage Cancer or Major Stage Cancer would be admissible. The total benefit under the Policy including Early Stage Cancer Benefit and Major Stage Cancer Benefit as specified above shall not exceed the maximum claim amount of 220% of Applicable Sum Insured. If the life assured claims for different stages of the same Cancer at the same time, the benefit shall only be payable for the higher claim admitted under the policy. If there is more than one Cancer diagnosed in an event, the Corporation will only pay one benefit. That benefit will be the amount relating to the stage of Cancer which has the highest benefit amount. A waiting period of 180 days will apply from the date of issuance of policy or date of revival of risk cover, whichever is later, to the first diagnosis of any stage cancer. No benefit shall be payable if any stage of Cancer occurs before the expiry of 180 days from the date of issuance of policy or date of revival and the policy shall terminate. If the policyholder is not satisfied with the “Terms and Conditions” of the policy, he/she may return the policy to the Corporation within 15 days-30 days. The amount paid will be returned after deducting the documentation charges. If premiums are not paid by the end of the grace period then the policy will lapse. A lapsed policy can be revived during the lifetime of the Life Assured, but within a period of two consecutive years from the date of the first unpaid premium and before the date of maturity provided that all the premium unpaid till date will be paid. A grace period of one month but not less than 30 days will be allowed for both yearly and half-yearly modes. For any medical conditions suffered by the Life Assured was caused directly or indirectly by alcohol or drug. For any medical condition or any medical procedure arising from nuclear contamination. How to Revive Lapsed LIC Insurance Policy? How to Download LIC Premium Payment Receipt Online?